Koi-Koi is a popular card game/rule in Japan played with Hanafuda. This HANAFUDA Japan contains this rule. And also the Koi-koi is one of declarations/callings in case a player has formed a yaku in Koi-koi game. There is two kind of calling "Koi-koi" and "Stop", if you want to continue, you say "Koi-koi." That's Japanese for "come on." (Korean players say "go.") When you say "Koi-koi," get ready for excitement. is popular card game in Japan with "Hanafuda(花札)". (Hanafuda are playing cards of Japanese origin (karuta cards), used to play a number of games. Koi-koi is a game for two players at a time. You can play "1 Player" mode with Computer(CPU). And You can also play "2 Players" mode with your friends or family by each iPhone / iPodTouch / iPad devices. The goal of the game is to form special card combinations called "Yaku" from cards accumulated in a point pile. ne game consists of 12 or 6 month hands, Win or Lose depends on total points of those hands. Determining the dealer is done at first, after that, 12 or 6 times month hands are done. An initial(*1) dealer (also called the "oya / parent / 親"), is decided upon when the game starts. Each player draws a single card; the player who draws a card from the earliest month(*2) is the dealer of first January hand(*2). If both player's cards are same month, the bigger point one is the oya. If both player's cards are same month and same point(*2), restart the determining the Dealer. *1 : After the initial month, the player winning the last hand becomes the new dealer. Should both players ever run out of cards to play, the next hand's dealer is changed. *2 : Card's month and point are described Cards page. *3 : The dealer is essentially beneficial because of the first move. After dealing cards, dealer's turn starts and end, after that opponent's turn starts and end, dealer's turn, opponent's turn, these flow repeats. 8 Cards to each player with face down and the table with face up, though this is done two cards at a time. The rest of the cards (24 cards) are set aside as a draw pile, and then play begins starting with the dealer. At this point, Dealt Yaku(*1) either player is dealt them before play begins, he is immediately awarded points. Play then ends before it starts, and the game continues to the next hand. *1 : Dealt Yaku is described Dealt Yaku section of Yaku page. Player's turn of the dealer or the opponent comes, the player do the following sequence. On a player's turn, at first he may match by suit (i.e. month/flower) any one card in his hand with one on the table. Alternatively, he may discard any one card from his hand face up to the table (which is his only choice if he can not match anything). If there are 2 cards matched on the table he select one, if there are 3 cards matched on the table total 4 cards including one hand card are matched to gain(refered to iii.). A Player draws one card from the draw pile and places it face up on the playing area. If this card matches any card now on the table, he must match that card; otherwise, he must discard it face up to the table. If there are more than 1 card matched on the table, rule is the same as i. Matching hands. If matched cards exists by procedures i. and ii. above, a player gains cards in his point piles. Once a yaku(*) has been formed in his point piles, he selects "Koi-koi" or "Stop". *"Yaku" is described Yaku page. 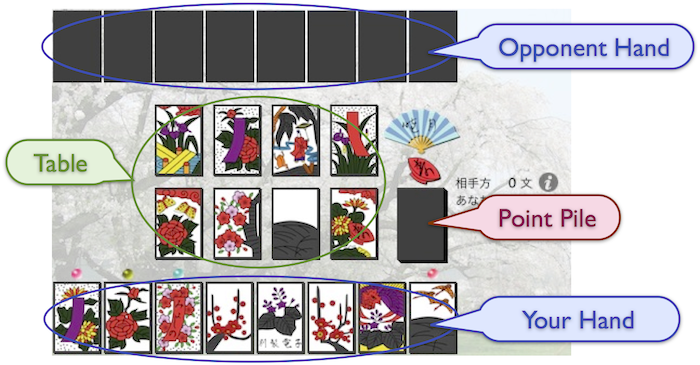 If a player selects "Stop", he gains all the points(*) he is entitled to from the yaku he has, after that a new hand (next month) begins. If a player believe that he will be able to form additional yaku for more points, he may selects "Koi-koi" to continue in an effort to gain more points. However, if the player's opponent is able to form a yaku before the player(who called Koi-koi), the opponent's score is doubled! *Yaku page describes about the points of yaku.